﻿ This is my first attempt at a personal infographic project. Using a free data set published on a website, I translated the data in a visual illustration. 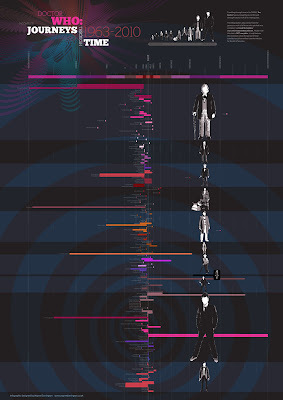 The data details every recorded time journey each of the Doctors have undertaken in television episodes - and my infographic plots each on a universal timeline. This then shows which of the Doctors has travelled the most. This is awesome! Exactly what I was looking for last night, and I find it today! Thank You!! This is totally awesome! If this is the product of your not getting out enough, I hope you don't mind if I say you should stay home more, hehe.